Blood Sugar Level of 347 one Hour after Eating? No diet, just a question: 1 hour after I ate my sugar was 347. For your information, blood sugar can be raised until high levels when someone is eating. In general, doctors would accept such blood glucose levels after eating as yours (of 347). However, you should measure your blood sugar 2 hours after eating to see how your body can assimilate the calories it gets when you eat. Next, it is advisable to measure your fasting blood glucose early in the morning, once you wake up. This is to understand how your body can assimilate what you ate last night and how it reacts to the morning hormones. If there is an impairment, then, you should perform A1C test. This is done generally in the laboratory, when they can extract blood and measure A1C level giving the average sugar level for the past 3 months. The pharmaceutical industry has moved forward and has come out with a new A1C test meter. You can perform the glycated hemoglobin test at home once 3 months. However, you would need any medical assistance to understand the readings. You should record your blood sugar readings, and pass them to your health care provider (doctor, nurse) to further evaluate and judge whether you should be worried or not. You can also pass to me your records, so I can give a better judgement. Is Blood Sugar of 212 after Eating High? Is Blood Glucose of 92 mg/dL Good? Is Sugar Range of 107-110 High? Can One be Diabetic with PP of 103 and fasting 122? Am I diabetic with blood glucose after taking sweets? QUESTION: Sugar level 105 to 128. It is obvious that in April your blood glucose level was quite high - up to 565 mg/dl as you said; while the normal blood glucose level ranges 64.8 to 104.4mg/dl. But now, thanks to the good control of yours, it is almost within the normal ranges. However, there are several other things, which you can do in purpose to reduce your blood glucose level even more, and lose weight too. According to the blood glucose results, which you have provided, I can conclude that you have been diagnosed with diabetes several months ago. Because of this fact, it would be even easier for you to lose weight. There are three very simple, buy hard steps, which you have to follow to succeed, including diet, herbs and doing exercises. 1. I supposed that your doctor have already informed you about the diet that you have to follow. However, now I’m going to give you some basic directions, because the diet is the most important element in the weight losing process. - First of all, you have to reduce the amount of carbs acquired per day. - Try to eat 5-6 times a day, but small portions. This way of eating will ensure your body constant intake of nutrients, which will be used in proper way. 2. 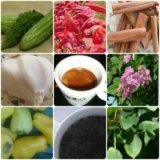 Usage of herbs is important for your glucose metabolism, because herbs like gymnema sylvestre, bitter melon and cinnamon have shown to improve the glucose metabolism. The usage of these herbs leads to more adequate usage of the blood glucose. When the glucose is used in a proper way, you will not gain weight, which makes the losing weight process even easier. Important fact is that these herbs are effective only when they are combined with effective treatment. You can’t use herbs without drugs unless you are having the desired results, which assume the interruption of drug use. 3. Doing exercises improves the blood glucose metabolism even more. When you are running, for example, you are using energy provided by the glucose, which leads to reduction in the blood glucose concentration in your blood. So in purpose to obtain the needed effect, you should start running for at least half an hour in the evening or in the morning. If you are running more than half hour, it would be even better for you, but after all, everything is a matter of training and strong willing. As you can see by yourself, these three steps are reducing the blood glucose level of yours. This is the most important thing when you have diabetes as the higher blood glucose level leads to higher cholesterol storage. The cholesterol storage leads to gaining weight. Because of this, when your blood glucose level is low, the cholesterol storage will be also minimal - you will not gain weight. I’m sure that everything will be alright if you keep up with the good work and soon you will see that losing weight is something achievable.